Heat oil until hot. Pour in mustard seeds and cover immediately. After the seeds have stopped sputtering, add the spices and fry for a minute or so. 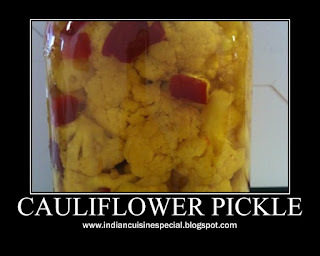 Add the cauliflower and fry for a minute or so. Pour the cauliflower with the oil and spices into a heavy jar or container. Pour in the lime juice. Throw in the serrano peppers. Heat more oil and pour on top. Add enough hot oil so that no vegetables are exposed. Cover tightly. Allow the jar to sit in a sunny area if available. This helps in the pickling process.